When buying Calla Lily bulbs, be careful not to buy bulbs that are too small to flower in their first season. Patience may be a virtue, but there is nothing worse than the expectation of a flower and no flower appearing. This often causes the gardener to believe that they have no success growing Calla Lilies, where often it is the fault of the bulb being sold too small. The photograph with this article shows the two types of bulbs. Flowering, and not flowering size. If you look closely at the flowering size bulb, you will see baby bulbs growing on the side of the large bulb. These baby bulbs will become bulbs of the not flowering size next season. Only the season after, will these bulbs be large enough to flower. 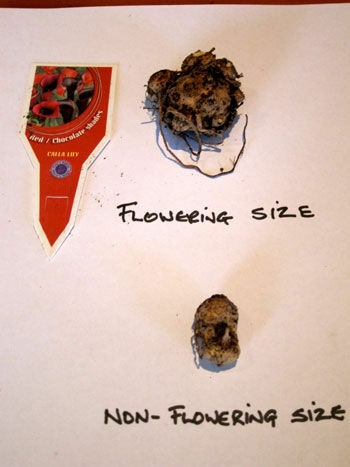 Be wary when buying bulbs and make sure they are of flowering size. Yes, size does matter when it comes to some bulbs! Plant the Calla Lily bulb, three times it's width under the soil surface, smooth side down. Start to water when the green shoots appear above the soil surface. Calla Lilies are clumping plants and are dormant over Winter. There is no need to remove the bulb over the Winter months.